Your Jeep or Mopar-product doesn't need to go without the best ATF. 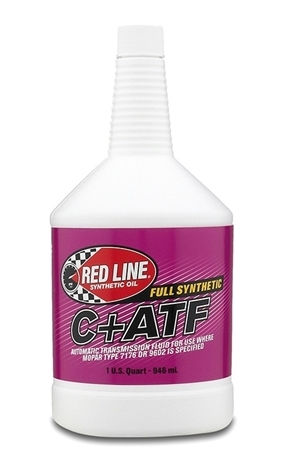 RED LINE C+ ATF satisfies the performance requirements of Chrysler MS7176, ATF+, ATF+2, ATF+3 and ATF+4 while providing 30% greater operating viscosity, 1/3 of the evaporation of petroleum ATFs, improved oxidation and sludge protection. Red Line C+ ATF provides the exact frictional characteristics required in the MS7176 specification, providing proper shift feel and proper lockup torque converter operation. The use of an improper fluid could cause torque converter shudder or harsh shifting. Red Line C+ ATF also provides the best low-temperature shiftability in automatic transmissions allowing proper shifting at extremely low temperatures and will flow down to temperatures as low as -60°C. The improved wear protection makes C+ ATF the perfect automatic transmission or transaxle fluid for Chrysler vehicles.